It has been a long, cold, wet and windy week. March has been as predictably "Marchy" as you could imagine. In fact, after a series of strange seasons we have settled down to things being exactly as they should be. It is a small satisfaction. I have been searching for a gap in the weather to take some pictures. There wasn't one to be seen. Eventually I set out into the garden on Thursday under cover of the mist and managed to get soaked without the need for rain. The pictures were grey and uninspiring and the entire garden seemed to be in bud just waiting for better times around the corner. I awoke this morning to the sound of wet tyres swishing along the road, turned over and went to sleep again. I wanted to do all sorts of things today, even in the rain, but not as much as I wanted to lie in bed for a bit longer. Suddenly the clouds parted, the sun came out and we are in cheerful March rather than depressing March. I went out and took all the same pictures again and this time there is a sense of rejoicing about them. Since Thursday the Pleione buds have opened. Those that I kept wet through the winter are far more advanced than those that were kept dry in the other greenhouse. I don't know if it is the moisture or if there is a temperature difference. I'm too lazy to chart the temperatures and find out. It is sufficient that P. Alishan 'Merlin' is looking beautiful in the sunshine. I have only had it for a couple of years and I thought that I had lost it. After flowering for the first time it went downhill and had a single tiny poseudobulb at the end of the first year. 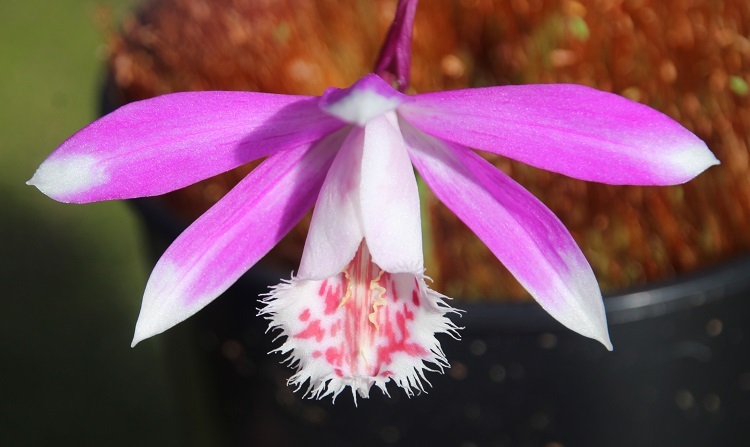 I think it is a common problem with new Pleione. After being dried and sold they produce a flower reliably but struggle to establish after that. Ideally I think I should remove the first flower but it is difficult to do. I have a number of new cultivars flowering this year, only time will tell if I have the required strenth of resolve. 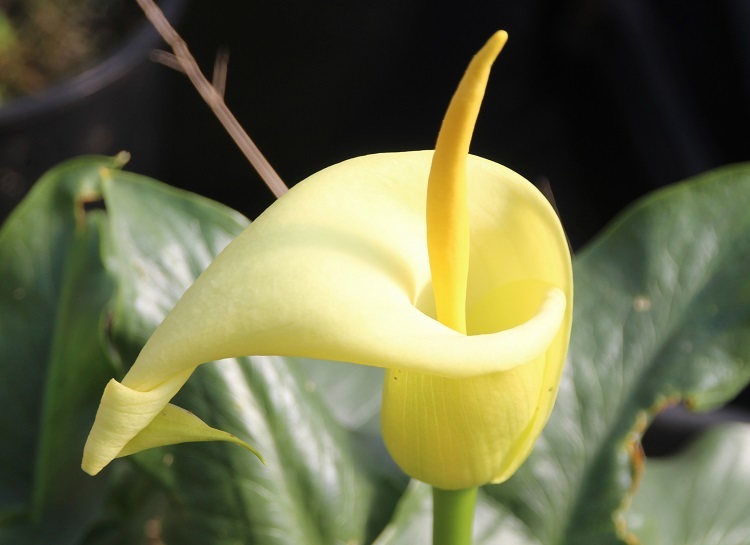 Outside, the buds of Arum creticum had swollen, the tips attenuated into exotic architectural shapes. They were very appealing, even as the mist condensed and ran down them in dire tears of misery. Its' home is in the dry mountains of Crete and Greece where it bursts into flower in the space between the chill of winter lifting and the drought of summer descending. It's remarkable that it tolerates the misty moderation of the Cornish climate, but it seems to be prospering. I have several plants in the garden, one growing under a Rhododendron that has yet to flower and prove its identity, interloper Arum species have occasionally been common in the trade - caveat emptor! Growing in the sun I have a plant that I bought from Bressingham Gardens in their golden age - from their latest catalogue it looks as though those times may still return and I wish them well. It lurked in my mothers garden for a decade like a spotless Arum maculatum before finally producing the scented yellow flower I had hoped for. I small piece came back home with me, where it has settled more rapidly. When I bought it this was described as the 'FCC' form - First Class Certificate after trial by the RHS. In the last few years this clone has been named 'Karpathos' in respect of its origin, collected on a Kew expedition to the island of Karpathos in 1953. A few years ago I bought a plant under the new name and it grows in a tub in the greenhouse. The flowers on both plants opened yesterday so it has clearly adapted to a wide range of conditions. The Mediterranean islands are home to an astonishing range of plants that rush into flower in the spring, using the store of winter rain in the ground to burst into expansive bloom before the heat of summer dessicates the surface. 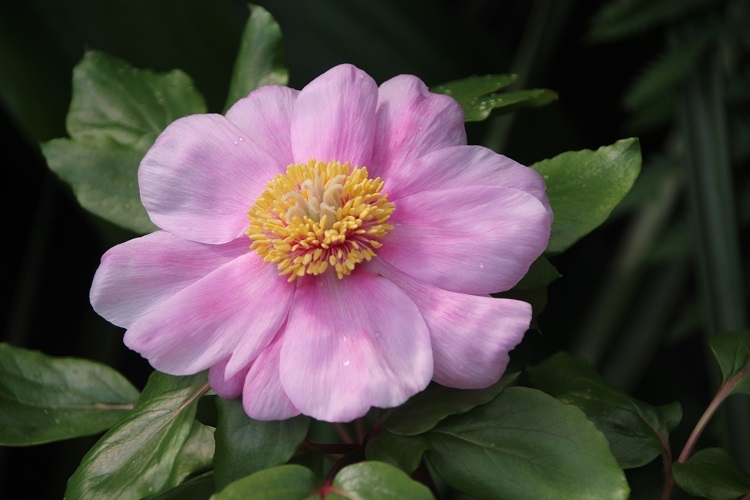 Paeonia corsica has a wider range than the name might suggest, being found on Sardinia and the Ionian Islands as well as Corsica.I keep it in the Agave house, along with P. cambessedesii and a couple of other species. It is almost certainly hardy here but the extra protection of the greenhouse ensures that the blooms last in perfection whatever the March weather offers. I am mildly obsessed with P. cambessedesii. Its rarity in Majorca adds a certain glamour to the precocious flowers. It isn't rare in cultivation, the seed is freely produced and germinates easily, but it retains an aura of exclusivity with suggestions that it isn't reliably hardy. P. corsica is seen less frequently, though it should be the hardier of the two. It also seeds easily and for me it has been a better looking plant. The number of shoots has increased every year to make a good mound of metallic green foliage scattered with the flat pink flowers on the tips of the shoots. It has always flowered a week later than P. cambessedesii which shouldn't matter (but it does). Still, it gives a better effect once I am over the shock of big pink scented peonies in the middle of March. 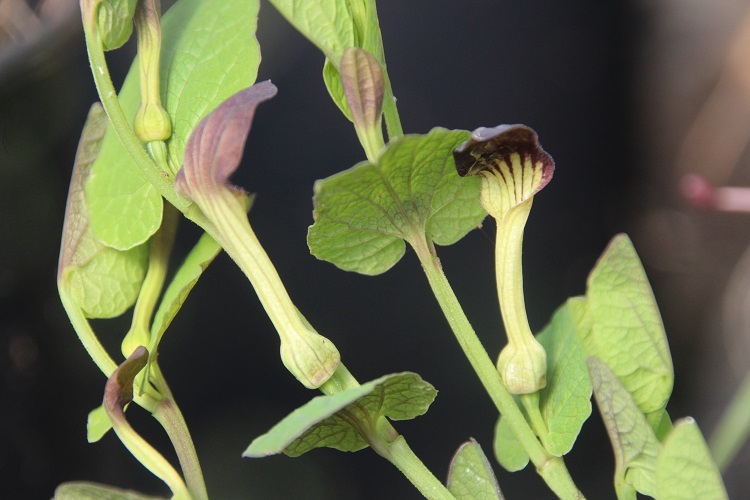 I have a small collection of climbing Aristolochia slowly engulfing the framework that holds up the Agave house. It is too dry for them in there as the creeping hordes of red spider mite in summer will testify. However, it is warm in spring and protected from the worst of the wind, so it will have to do for now. I have been waiting for them to flower with a stoic resignation borne of barren years. This year as the first leaves are breaking from the buds I have tiny flowering shoots developing by their side on A. delavayi. At least they might be flowers, it might be A. delavayi, nothing is certain. At the same time I have a small number of herbaceous species growing in pots in the greenhouse. They should all be hardy outside but they like sun, I don't have much of that. It would take courage, and I don't have much of that either. It took me 40 years to realise that A. clematitis was really quite easy. I have several, I can try one in the sun this year. A. pistolochia is a bit more precious. I bought mine last spring and I still only have a single pot, though it is producing new shoots with enthusiasm. I might try to split it if there is a warm interlude that seems suitable. It is an uncommon species from the south of France, trickling over the border into Spain. I bet they haven't been getting the gloomy mist there. Perhaps it can stay in the greenhouse for a while yet.